As a fairly new member of the Thibodeau Family and Green Thumb Farms I haven’t had the privilege of seeing this farm’s progression over the years. This summer marks my 3rd anniversary at the farm and the 50th Anniversary for the company. This led me to dig into the farm’s history a little to see how much it has changed over the years. Since we are wrapping up our planting season I thought it would be appropriate to start with the planting operation. When Green Thumb Farms began farming in 1965 we started with around 75 acres, all of which were potatoes grown for Frito Lay. 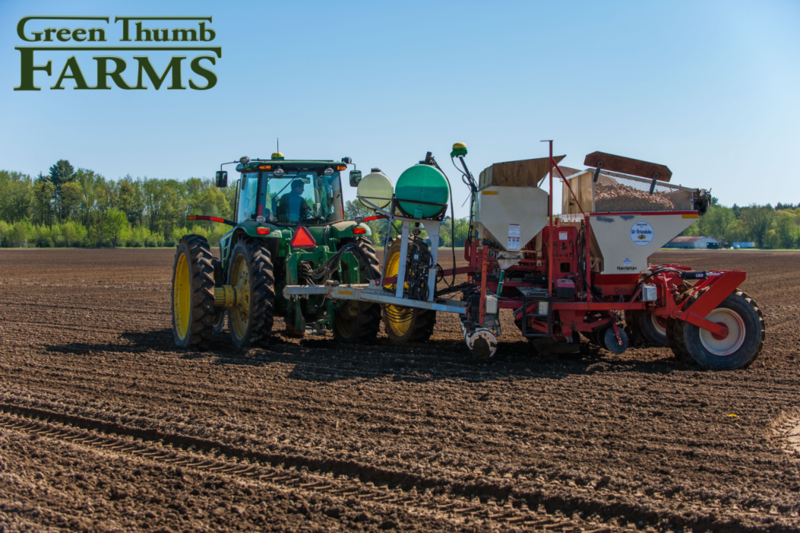 This year we will be planting just over 700 acres of potatoes, almost 900 acres of corn, 265 acres of beans, around 200 acres of miscellaneous grains, and maintain 100-125 acres of turfgrass. The majority of our potatoes will be sold to supermarkets, some will go to food service companies and a portion will go to processors. With the increase in acreage comes the need for a larger crew! In 1965 the crop was planted with just 3 employees. This year we will have over 20 employees supporting our planting operations in some capacity. My how things have changed!